Well, today was a complete turning of the tables. Although it was an interesting and insightful day, as the previous two have been, today was quite an emotional one. We began at Notre Dame de Lorette French National Memorial and Cemetery. 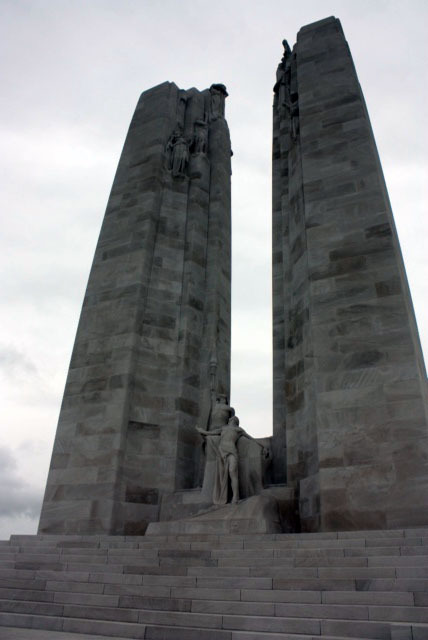 Here, we were able to gain some knowledge that I’m sure many did not know: the contributions France made in the early years of the war, which made the capture of Vimy Ridge by the Canadians possible in 1917. The significant losses the French sustained during this period were demonstrated by the 40,000 graves at this cemetery. For many of us, it was a surprise, a shock, and an extremely moving experience. Besides the sites and memorials we visited afterwards, we were also treated to six presentations, all of which struck an emotional nerve, leaving many of us in tears by the end. Eric Fowler started us off with a presentation on the repatriation of the Unknown Soldier at Cabaret Rouge Cemetery. His references to the mystery of the many graves marked “A Soldier of the Great War,” and the sadness tied to the fact that so many soldiers have become faded memories was powerful. The next presentation was Eric de Kroon, who presented a biographical piece on R.H. Britton at La Targette Military Cemetery. Eric was able to demonstrate Britton’s qualities as a leader in the community, which transcended onto the war front when he fought for King and Country. After a few other stops along the way, the group made its way to Vimy Memorial. One could not help but to admire the size and beauty of this monument, as its white stones contrasted with the grey afternoon sky. Here, three other presenters sent another wave of emotions over us, when two biographical presentations and one historical one was given. Becky Weir started us off with the Battle of Arras in April 1917, who surprised us with the number of British Imperial and French troops lost during this battle. Comparing it to the Battle of the Somme, mentioned in the previous blog, the Battle of Arras was much worse when looking at the number of fallen soldiers each day. Next, Colleen Molloy gave us her presentation on R.J. Galloway. She was able to provide us with beautiful photographs of postcards, telegraphs and photographs that helped us envision Galloway in an extremely vivid way. The heartbreaking story of a father’s attempts to get his son back to his hometown for a burial left a lump in the throat of at least a few. The last presentation at Vimy was given by me (Eric Story). I gave a presentation on R.J.G. Bateman, and demonstrated his shift from an intellectual professor, to a pro-war enlistee, and finally to a realistic, hardened soldier who died fighting for a better tomorrow. Graham Broad gave us our last presentation of the day, which was highly emotional for all. He ended with a quote from Macbeth, and told us that he saw his soldier, Alfred “Eddie” McKay, reflected in his own personality, and that he had ultimately become a friend. I think all of us that have done a soldier presentation can relate. I also think that today, many of us on the tour became closer friends because of the emotions all of us were able to share at one point or another.